BOSTON – Around midway through the first round of Thursday night’s NBA Draft, Texas A&M big man Robert Williams became a hot topic of conversation among the Boston Celtics’ front office brass while they were huddled around a table inside the “War Room” at the Auerbach Center. A unique blend of length, athleticism and rim protection skills allowed the 6-foot-10, 240-pound 20-year-old to land on Boston’s radar, and the organization was ready to pounce if he dropped all the way down to their lone pick, late in the first round. Team after team passed on Williams, before he eventually fell right into Boston’s lap. The made the call to the league without hesitation, officially welcoming Williams into their brotherhood. What was it that sold the Celtics on Williams? Well, it was a large combination of NBA-level attributes according to Stevens, who spoke with the media moments after the pick was made. Williams averaged 11.1 points, 8.7 rebounds and 2.5 blocks per game during his two seasons with the Aggies, while playing 25.7 minutes per contest. He was downright dominant on the glass with an offensive rebounding rate of 11.9 percent and a defensive rebounding rate of 24.0 percent. Interestingly, the Celtics did not work out Williams at their practice facility as they did with roughly 60 other prospects. But that doesn’t mean the front office didn’t do their homework on the prospect. What Ainge and the rest of Boston’s talent evaluators discovered while scouting Williams was that he possessed a bunch of characteristics that the Celtics were somewhat lacking. One area that Williams needs to improve upon is his shooting ability, but he still has a lot to offer on the offensive end in the meantime. He excels in the pick-and-roll, is great at converting on lob passes, and, to the delight of Stevens, has shown signs of becoming a strong playmaker. Day 1 for Williams is set for June 29. That is when he is scheduled to be formally introduced to the team at their new training facility, and that will be his first opportunity to slip on his new green and white uniform. 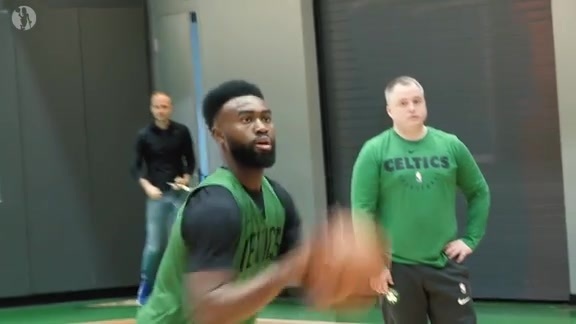 And from there, the NBA grind begins for the newest member of the Celtics. Mailbag: 5 All-Stars? Captains? Rotations? Warriors Kryptonite?